You can fix your own big toe joint pain, in most cases. It can occur very rapidly if it is due to tight tissue compressing your toe joint. The muscles in your lower leg and foot will be some of our main targets. If they are tight and you release them, your pain will disappear. Just follow along with the videos below, and take your time. Thousands of people before you have benefited from these videos, so just dive in and give it a try. Intro, Video 1, Video 2, Video 3 . It's important to note that big toe pain can also be a sign of gout, which occurs from having too much uric acid in your body. High uric acid levels are often associated with extremely high levels of protein in ones diet, especially certain types of seafood. If the techniques offered below do not help, I recommend you have your doctor check your uric acid levels to rule out gout (or even pseudogout) as a cause of your big toe pain. Now, just take your time and follow the instructions below and you'll most likely be pleasantly surprised that you can fix your big toe pain all by yourself. *Please Watch This Short Video First. Thanks. Please visit the techniques page now, if you haven't already. On the homepage I describe…in detail…the 3 Simple Steps and the 4 Basic Facts about your body that make it possible for you to provide your own joint pain relief. Step 1 targets two main muscles. One muscle that extends……pulls up…… your big toe joint (extensor hallucis longus) and the other muscle flexes……pulls down…… your big toe joint (flexor hallucis longus). Often times, a quick release of both of these is all you need to get substantial big toe joint pain relief, but do continue on and do Steps 2 and 3, since you may find other culprits as well. Sit in a chair with your legs crossed, so the ankle and heel of the big toe that hurts is resting on your thigh. Press both of your thumbs into the soft tissue between your shin bone and your achilles tendon. Focus on the area just above your ankle to about half way up your shin bone (extensor hallucis longus), and notice any tender spots. Now we're going to do the press-hold-move technique. Maintain pressure on one tender spot at a time while you FLEX your big toe up and down (moving other toes in addition okay as long as your big toe is moving up and down). You should feel the tissue you are pressing on move just a little bit as you flex your big toe up and down. Stay on one spot for 5 to 10 reps……then move to other tender spots for a while…….and then return to the spots that still need more work. You may find they let go from the work you've done elsewhere! 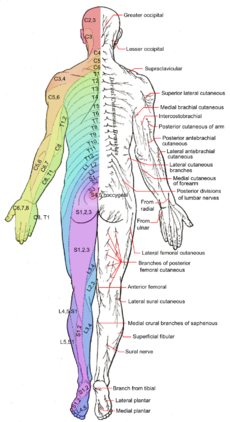 Repeat this process on all the tender tissue spots in this area. Notice how much big toe joint pain relief this technique provides. With your leg still crossed so your heel and ankle are resting on your opposite thigh, we're now going to work on the muscle that causes your big toe to flex down toward the floor. With your heel and ankle resting on your thigh, take both of your thumbs and place them on the tissue that lies between your achilles tendon and your lower leg bone. From the area just above your ankle to about halfway up the back of your leg. Now we're going to do the press-hold-move technique with our thumbs. Maintain pressure on one tender spot at a time while you Flex your big toe up and down. You should feel the tissue you are pressing on move just a little bit as you move you flex you big toe up and down. -this is meant to give your lower back a gentle traction, so make sure your buttocks are gently touching the floor and not hanging in the air. -the stretch actually works a bit better when you use some pillow to support your thighs. You want a bit of a stretch in your groins, but if it's too much it will cause you to get less of a good gentle traction on your lower back than if support those thighs just a bit. -when you come out of the stretch please go slowly. First, turn on your side before trying to get up. -only do this stretch for about 5 minutes the first time you do it. You can build up to fifteen minutes or so over time, but take it easy the first time. You can always do more later. Lastly, has there been noticable big toe joint pain relief from this one technique? Take a moment to assess, so you know how valuable this stretch can be. -you can do this stretch as often as you'd like! Does this stretch change your level of big toe joint pain? Make a mental note if it does! The hamstring stretch demonstrated in this video is pretty straight forward, so if you've got it down and it works for you then just continue doing it. That said, my new Best Hamstring Stretches Page (click here) gives a great overview of a variety of hamstring stretches (including the one in this video that may serve you even better. Please do feel free to check it out! Sit in a chair or lie on your back to what follows. While seated, position the foot you want to work with on top of your opposite knee. Generally, you'll want your outside ankle bone resting on top of your knee. Reach over the top of your foot with the hand from the same side of the ankle with ankle pain and press your fingertips into the top upper half of your foot. Flex your toes up and down, especially your big toe, and let your fingers feel the muscles that perform that function moving under them. These are the muscles you want to make sure are free. Now take your other hand and reach under your foot so that your fingertips land on the top half of your foot in the same general area as the fingertips from your other hand. Now do the press-hold-move technique. Notice how much big toe joint pain relief this one technique provides. On the bottom of your foot are the muscles that flex your big toe downward. They run along the bottom of the foot and attach to the bottom of your big toe joint. If they are inappropriately tight they may pull on the joint and be the cause of your big toe joint pain. Sit in a chair and cross you legs so that the foot with the big toe joint pain is resting on your opposite thigh. Generally, you want your ankle and heel resting on your thigh so you have the easiest access to the bottom of your foot. The three muscles that we want to work with are all located on the "big toe side" of the bottom of your foot. In other words if you draw a line down the middle of your foot from your toes to your heel, you would be working on the half of your foot with your big toe. Take both of your thumbs and press them into the tissue from just forward of your heel up to the big toe knuckle in the bottom of your foot. Notice any tender spots. Now, using both our thumbs, we're going to do the press-hold-move technique on any tight tissue. Go ahead and PRESS on a tender spot with both of your thumbs, and while maintaining that pressure, flex your big toe downward (flexing other toes is okay too). You should feel the muscle moving a bit under your thumbs as you flex. Keep pressing, holding, and flexing on all the tender spots you find. You can move to other spots if one is particularly stubborn, and then return to it later. Take a break when needed, your thumbs might need to rest a bit. Notice how much big toe joint pain relief this technique provides for future reference. Is your big toe joint pain completely gone? Partially gone? Which techniques gave you the most big toe joint pain relief? Was there one specific big toe joint pain treatment that instantly relieved your foot pain? Remember what worked best for you, so you can do that first next time you need it. Are you still experiencing some big toe joint pain? Which muscles are still tender (that means they are too tight!) and could use some more work? Go back and repeat those techniques that seem to need a few more rounds. You may be pleasantly surprised at the results you get now that you've released other muscles that may prevented them letting go on the first attempt. 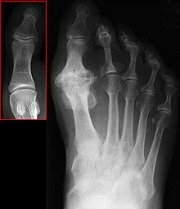 Investigate a bit and you'll eventually find which techniques work best for you to provide the best big toe joint pain relief. Then you'll be able to fix yourself whenever you desire because you'll have your own personalized big toe joint pain relief treatment……literally at your fingertips!